I was recently delighted to discover M. Night Shyamalan’s brilliant book, I Got Schooled, which I now consider essential reading for anyone running a school. Mixed in with his thoroughly researched conclusions were occasional references to the work of Doug Lemov, who does for teaching what Shyamalan’s work does for school administrators – it precisely spells out pragmatic, sensible, and thoroughly evidence-based guidance on how to be outstanding in their fields. In this case, the work is based on his observations of the best of the best teachers he could find, working in high poverty areas that usually fall at the low end of the success scale. These teachers took the kids all the way from the bottom to the top. 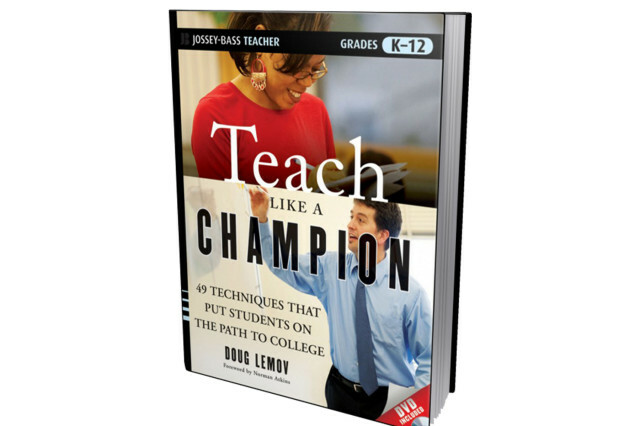 In Lemov’s book, Teach Like a Champion, he spells out “49 techniques that put students on the path to college,” all of which are eminently do-able and straight forward. In this respect it reminds me of CPTED – commonsense, easily applied solutions, if only we’d known. I don’t want to steal his thunder, but I’ll pass on a sample technique: no opt out. Let’s say you ask Jimmy to identify the capitol of the United States. Jimmy replies, “I dunno.” In many schools that would be the end of it – you’d move on to ask Mary. Jimmy learns from this experience that if he says “I dunno” it’s a free pass. He doesn’t have to try. He can go back to daydreaming. But with the “no opt out” approach the teacher doesn’t let Jimmy off the hook. Instead, they return to him after Mary gets it right. “Now Jimmy,” asks the teacher, “what’s the capitol of the United States?” If he’s paid even minor attention he should be able to answer correctly. He has also now learned that he might as well try to answer the first time around. If he’s intentionally resistant that’s another matter, and Lemov has other tips for those cases.